Martin de Candre Shaving Soap, at one time, was the pinnacle of all things great in the wet shaving community. It was classy, select, top shelf, and to many, the gold standard in lather and performance. Many wet shavers were envious every time they saw a shave of the day picture on a forum or Facebook that included this gem. After all, this soap was hard to get, was risky, and very expensive. In addition, it was a vegetable based soap which spit in the face of traditional tallow based soaps. In order to get the soap, it had to be purchased from the maker, in France. You had to pay over $50 for the soap, plus international shipping. There is always a little risk involved when you order stuff internationally. There seemed to be three crowds when it came to Martin de Candre. People who said it was overpriced and not worth it. In the 1970’s, Dominique and Rosine Dauge settled in the village of Fontevraud L’Abbaye. Looking for a new business, Rosine learned the art of soap making from a chemist named André Chapuis. From there, Martin de Candre was born. The business was passed down to her daughters, where they continued with the traditional methods of soap making, while turning it into the global success that it is today. They pride themselves on the fact they use 100% pure vegetable oils in their soaps with natural essential oils. Everything that they do in their small family run business is hand made, from weighing, packaging, and making the soaps. Original, Fougere, and Unscented were the three scents back in the day. Original was a Lavender and Rosemary style scent. It seemed to be not as well received as the Fougere. The Fougere, or French for Fern, seemed like it was the better scented soap in the wet shave community. I agree with them, it is quite possibly the best smelling scented soap I have ever tried. Speaking of Fougere, bookmark that thought, as it will serve as a later topic in this article. So basically, it is stearic acid and coconut oil. That’s right, it is just two main oils. The soap is hard and jam packed tightly in the glass jar, so a new jar is very easy to load and lather. Your shaving brush can easily create a nice fluffy lather off the top of the jar. Because it is made of glass, I never hold it in my hands. I keep it on the counter top. Because of its habit to have overflowing frothy lather, it is not a good idea to get slick soap on your hands while holding a $70 jar of shaving soap. MdC is loaded with coconut oil which makes lathering very easy. In addition to the ease of lathering, it does provide a very good shave with ample slickness. This is my personal experience as well as many on YouTube and shaving forums. The performance was one of the best. Back in the day, Martin de Candre Shaving Soap was the pinnacle of shaving soaps, or as the haters called it, the most overrated soap out there. It had a reputation of being the easiest soap to lather. It was not uncommon to read reviews or hear people review it with phrases like “MdC lathers itself,” or “You can just touch the brush to the soap and the lather explodes.” I could give more, but I think you get the point. It was considered high end or luxury. 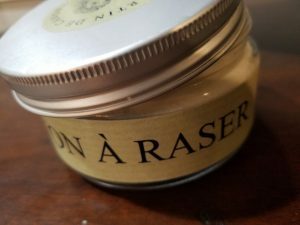 It comes in a nice, heavy glass jar with a screw top lid that is filled to the brim with wonderful smelling shave soap. In addition to the glass jar, it also comes in the famed SHAVING SOAP – LE BOL EN BOIS, which means something like wood bowl in English. In the States, we refer to it as The Brain Bowl. Because their soap is made by hot process, it can have a unique texture to it. When you put it in a bowl, and it overflows out of the top, it kind of looks like a brain in a bowl, hence the name, brain bowl. In addition to the packaging, it came with the high end cost. With shipping, you were looking at $60-$70. Many could not afford that, and many would not pay that. Because of the select few who owned it, it became a highly prized commodity in the wet shaving world. And every time it showed up, the questions would follow. How is the performance? How is the scent? What are the ingredients? Is it as good as Tallow? At some point, MdC usage seemed to pick up, and it seemed like more and more people were using it. One of the reasons is because it became easier to purchase in US. This happened because of good ole capitalism. See, some people figured they could order a large amount from France which would reduce the overall shipping per jar. They would place a large order and sell them to people with a little mark up. People seemed to feel a little more comfortable ordering it from “Bob” in Scranton, OH than they did from France. In addition to that method, some people would take large orders, then order the soap from France. Money was taken up front, so there was not that much risk from the person who ordered a bulk supply. Once they received their bulk order, they shipped them out to all the people who prepaid. Everyone was happy. Later, a vendor in CA started selling them, but they no longer do. MdC became key in helping to kick start some of the artisan soap makers that started popping out of the wood work like crazy. Because of its rise, so did the desire to reverse engineer this masterpiece. It had a simple ingredient profile, so reverse engineering it was not overly complicated. Soon, shaving soap recipes started popping up everywhere, and one of the keys to a lot of them….you guessed it, their key ingredients were stearic acid and coconut oil. Over time artisans who used this ingredient profile started making soap, and then more artisans started popping up following the same ingredient profile, with some of them probably doing it because of the success of the artisans, and not so much MdC. And just because you see an artisan using this base recipe does not mean that were mimicking MdC or other artisans who were mimicking MdC. The fact is, those 2 ingredients are some of the best when it comes to making shaving soap, according to soap makers. Earlier, I had mentioned the Fougere scent of MdC. Let’s get back to that. When MdC’s popularity began to rise, so did the discussions around Fougere. There seemed to be many threads on this scent profile, and it had a lot to do with the rise of MdC. Shortly after, Fougere became a buzzword in the community, and then, Fougere scents started popping up all over the place. Martin de Candre helped to shape the online wet shaving world as we know it today. Ok, so we have looked at MdC a bit over the last few years, and we looked at how it helped to shape the artisan scene. So where is MdC now? Martin de Candre shaving soap is still chugging along, and they have even released some new scents, but with the explosion of artisan shave soap companies, and even online vendors branding their own soap, MdC seems to have lost a little bit of its luster. MdC was the shiny new toy for awhile, but today, there are so many new scents, vendors, and products coming out each month, that its hard for anything to remain in the limelight. Is it worth it? Not really. For the price, you can purchase several other high quality shaving soaps with great scents with equal or better performance. Granted, it won’t come from France, be in a glass jar, or come from a secret family recipe taught by a French chemist. It won’t have the oooohhh and ahhhhhs that come from importing in a $70 soap. But, if you are wealthy or a wet shaving enthusiast, go for it. It will produce a great lather, great slickness, and it comes in nice scents. Especially the Fougere, man that stuff smells so good. In addition, it should last you a long time. If you want a similar style shaving soap, with great performance and a similar ingredient profile, take a look at Catie’s Bubbles which is offered at amazon. Catie’s adds in shea butter and jojoba oil so you should get a similar quality shave but with a little bit better skin food. Martin de Candre is a fantastic soap with a great history and a great reputation. If you ever get a chance to try it, you should, especially the Fougere. Did I mention how good that smells? If you have a comment or question, please let us know, and thank you for taking time to read our article! We appreciate it! Also, check our some of our other articles that look at great shaving soaps.